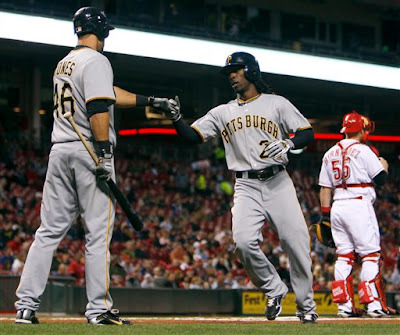 Andrew McCutchen has been named rookie of the year by Baseball America. McCutchen batted .286 with 26 doubles, 9 triples, 12 home runs, 54 RBIs, 22 stolen bases and had a .364 on-base percentage in just 108 games for the Pirates. Garrett Jones was also named to the all-rookie team. Jones hit .293 and led all rookies with 21 home runs. Not bad for a team that finished with 99 losses. We should expect a bobblehead from both these guys next year. That's what Pirates fans look forward to ... bobbleheads.